If you'pre considering a home gym you are right to do your research. In this Total Gym XLS Reviews, we dive deep into this extremely popular product and take a look at exactly why it's so popular and if it stands up to all the hype. 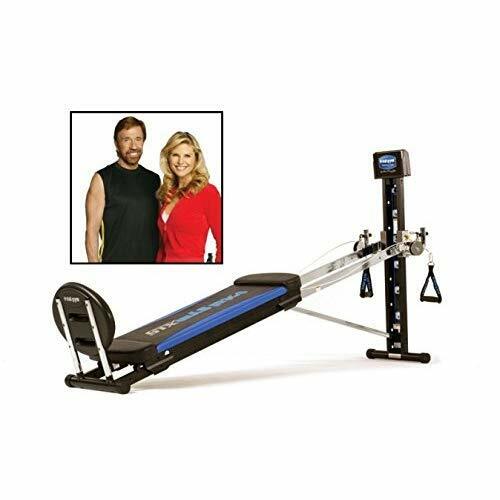 There has been a lot of talk about the Total Gym XLS, it has even been promoted by the one and only Chuck Norris. Having a celebrity promote your product seems to be the done things nowadays and Total Gym use an absolute icon of toughness to put his name to their product. I want to cut through the marketing and get to the facts to answer questions such as, does the Total Gym XLS work and what are some of the exercises you can do? Questions you no doubt have in your mind and ones you want an answer to from someone who has owned this home gym for over a year now. Me! First up, let's take a look at some of the key features which make the Total Gym XLS home gym so appealing. We will start with the obvious, with this machine you can perform 80 different exercises, from this single home gym. Targeting a range of fitness, strength, stretching and flexibility, having all of this built into one piece of equipment is what makes the XLS such a popular product in many of America's home gyms. When your equipment is not in use, having the ability to store it away somewhere where it won't get in the way, yet can be accessed easily is important. If you have a dedicated home gym room, then you're lucky as most of us don't have that luxury. So you need a home gym that will fold down and pack away neatly. With the XLS, you get just that. It's dimensions when folded, give it a depth of just 9″, which is perfect for storage under the bed or behind a door etc. One of the biggest complaints I see from all exercise equipment, especially home gyms, treadmills, and ellipticals, is that they can be so difficult to put together. This is where the Total Gym XLS really stands apart from the crowd in that it comes ready assembled, so all you need to do it unbox and get training. No more hours wasted trying to find the right bolt or nut. Total Gym claim that this piece of equipment is suitable for ages 8 to 80, which means it is a great option for all the family. From your kids to your grandparents, everyone can get involved and get fit. With that being said, I would supervise anyone under the age of 16 on any kind of home gym equipment due to the large weight stacks etc and the potential for getting caught in a moving part. At the time of writing the Total Gym XLS comes much cheaper than its initial price. As with any equipment, their price tends to drop over time and at its current price point, you can see what many people have snapped up this home gym. The warranty on all home gym equipment varies, ALOT. With the XLS, you get a 6 month on all parts, including a lifetime warranty on the actual frame itself. This is great for piece of mind, knowing that they stand by their product and will offer a replacement should the framework fail. The gym comes complete with a full body workout and exercise program designed to take the guesswork out of your training sessions. It show's you what exercises to do when to do them and for how long, kind of like having your own personal trainer on hand…without the cost. The XLS also comes complete with 5 workout DVDs, an exercise wall chart, training deck and nutritional program and meal planning guide. How's that for a complete product? Unlike most home gyms, the Total Gym XLS comes with a 400lb max weight capacity, to ensure that everyone can benefit from a great workout on this home gym. In some Total Gym XLS reviews, users have stated that despite being happy with the product they were surprised at the weight and getting is from the delivery truck into their home was difficult with just one person. The Total Gym XLS is the latest model that has taken the negative reviews of previous models and improved upon them. However, that does come with a price increase and some customers believed that to be too much. With that being said, since it's release, the XLS has come down in price significantly to a price-point that offers a top of the range home gym at a premium price. So you can make an informed decision, in this section, I break down the specifications of the XLS into easy to understand components. If you have a specific location in mind for the XLS then the detail below, which are direct from the manufacturer, will tell you how big the machine is both folded and when in use. We also take a look at the weight and max capacity and some of the exercises you can perform on this XLS home gym. Our opinion of the Total Gym XLS is that is is a strong piece of equipment that is perfect for your home gym and provide a vast array of exercises so your workouts will never get boring. Price wise, I think you get great value for the money considering how much this home gym as reduced by recently. If you're looking for an all-over body workout and a machine that ticks the boxes on both price and spec then the XLS gets our thumbs up.